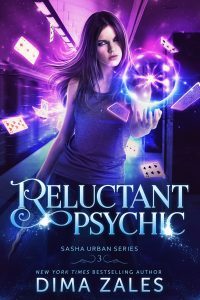 Reluctant Psychic is NOW LIVE!! Life as a seer is not all it’s cracked up to be. Especially when you’re unemployed, and your former boss blacklists you everywhere. Or when a legendary Russian witch calls in a favor owed, demanding the unthinkable. When danger threatens everyone around me, there’s only one man I can turn to—and he may not be what he seems. GET YOUR COPY OF RELUCTANT PSYCHIC!